Participants are encouraged to wear white. MAAFA is a Kiswahili word that means "great tragedy" or "horrific tragedy," referring to the period called the Middle Passage or TransAtlantic Slave Trade. During that time, millions of captives from Africa were brought to the Americas where they were used as a labor force, persecuted, beaten, and many, separated from their families forever. The word MAAFA is the concept of Dr. Marimba Ani, African-American scholar and author, and has been adopted in contemporary scholarship. The MAAFA Commemoration offers an opportunity for the whole community to pause and reflect on this great transgression against humanity and to personally, as a community, agree to distance ourselves institutionally in word and deed from that transgression, its legacy and the evolved practice of racism in our civic, social, spiritual and personal lives. 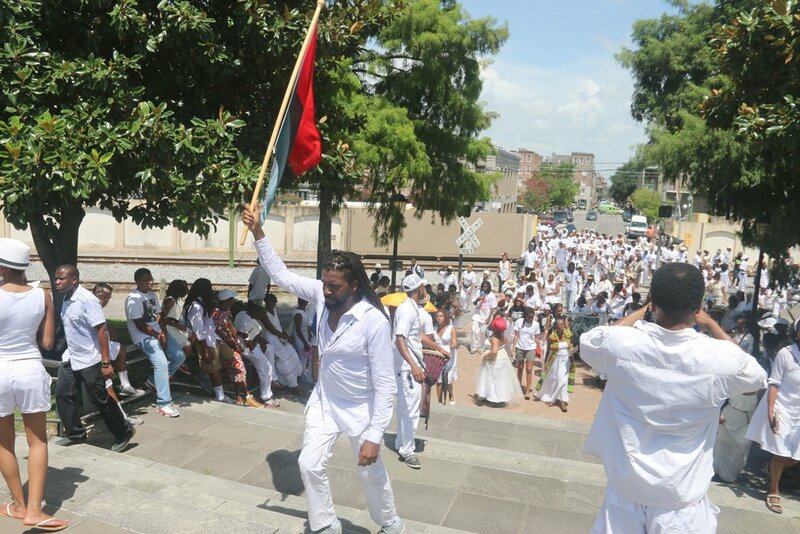 Drummers, dancers and musicians lead a procession from Congo Square through historic Tremé, with a brief stop at St. Augustine Catholic Church, the site of the Tomb of the Unknown Slave. From there, the procession continues through the French Quarter, with pauses at sites where slave auctions regularly took place. Then, at the Mississippi River, amid high spirits, drumming, dancing, singing and praying, ancestors will be honored by name--not just those affected by the Transatlantic Slave Trade, but also individuals who were victims of tragic events and senseless violence. HISTORY: In the year 2000, Ashé Cultural Arts Center's founders Carol Bebelle and Douglas Redd, engaged by Leia Lewis who coordinated the first Maafa celebration, joined with other similar celebrations around the country. The vision for the Maafa Commemoration continues to grow. It was influenced by the work of St. Paul Baptist Church in Brooklyn, which was then led by New Orleans-born Rev. Johnnie Ray Youngblood. There, an annual month-long series of activities form the MAAFA remembrance. For more information call (504) 569-9070.